I’m the sort person that sometimes rides around with my commuting bike in much worse operating condition than I would recommend to anybody I was helping at Bikeworks to maintain their own machine. Maybe once a person has a certain familiarity with bike maintenance they know how to push components just to the edge of failure before replacing them. Or maybe my DNA would be a perfect source for scientists to finally identify the elusive procrastination gene. Either way, I have recently had a close call with a Just Riding Along sort of catastrophic bike failure. As in “Gosh, I don’t know what happened! I was just riding along when for no reason at all my rear wheel disintegrated into a twisted mass of spokes and rim fragments”. 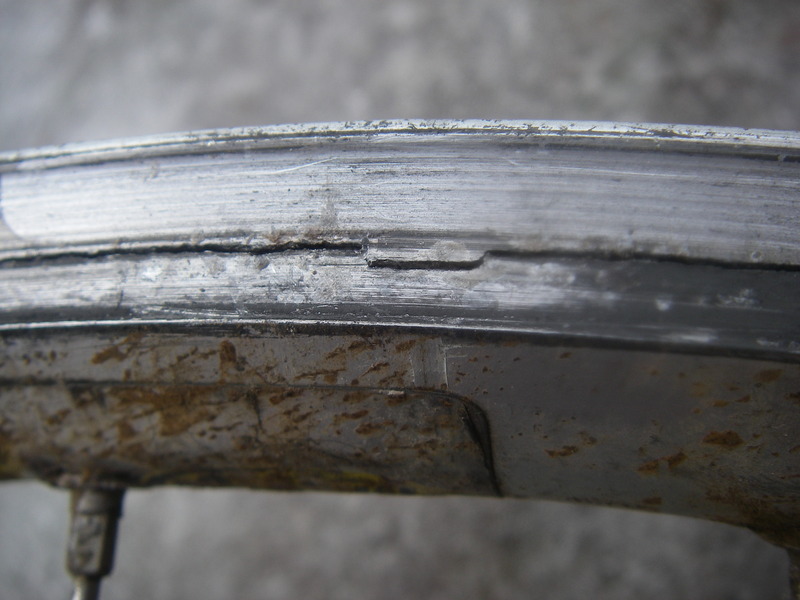 A few weeks ago I had my winter bike in the stand for a little cleaning and lubrication, when I noticed that the rear wheel seemed to have a hairline crack running along a lengthy portion of the rim. If I noticed that with the bike of a patron at Bikeworks I would recommend that they replace the wheel at once, before riding it any further. In fact, I would be quite insistent. Of course, I did no such thing myself. 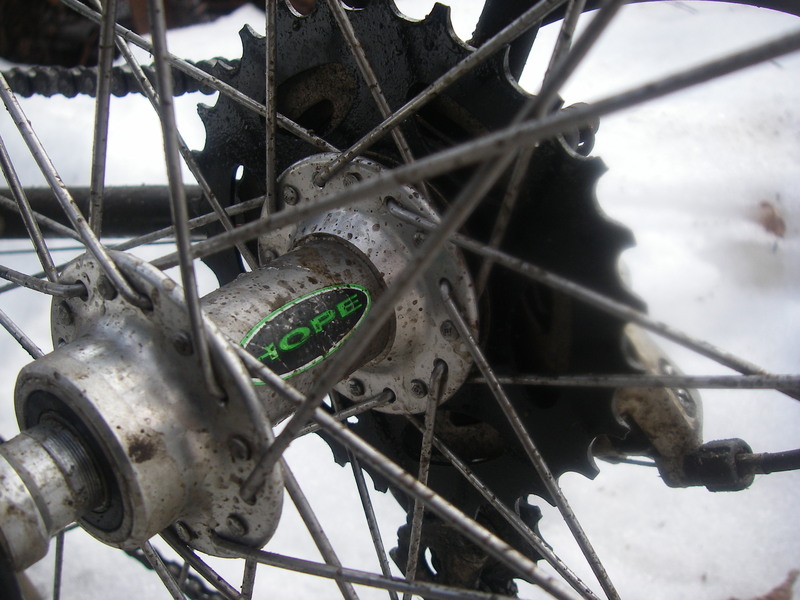 Instead, I rode my bike to and from work over bumpy, rutted, icy winter roads while slowly getting around to building a new wheel (all the while conspicuously not keeping a close eye on how my old wheel was holding up). 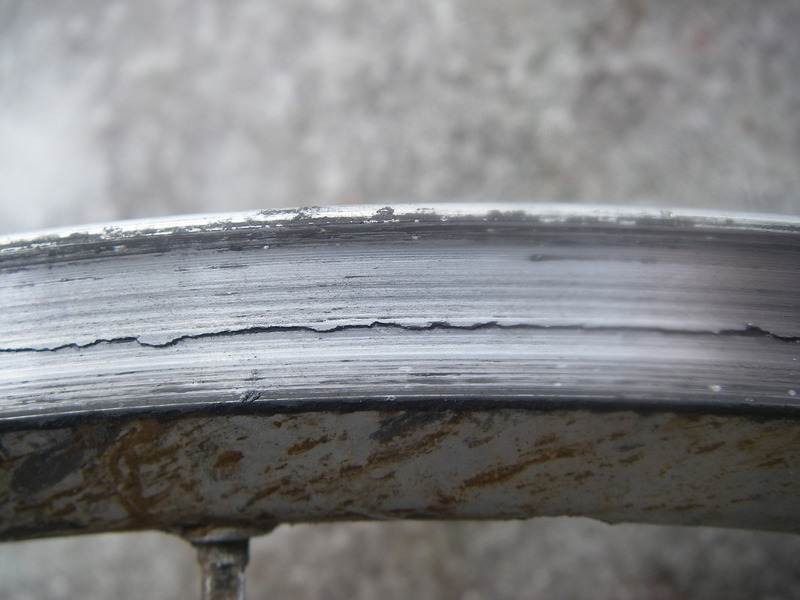 When I finally completed and installed the new wheel, I took a close look at the now shudder-worthy failing wheel. There is a very good chance that even one more trip with the old wheel would have resulted in an “exciting” mechanical failure. Some of it looked like this. . .
And some of it looked like this. So, don’t do that folks – it’s just stupid. Please replace your wheel promptly. Luckily, my story ended happily, with no accident, and a spiffy new rear wheel installed. Replacement wheel constructed from all used components, built around a nice, older Hope cartridge bearing hub (already getting dirty and earning its keep). 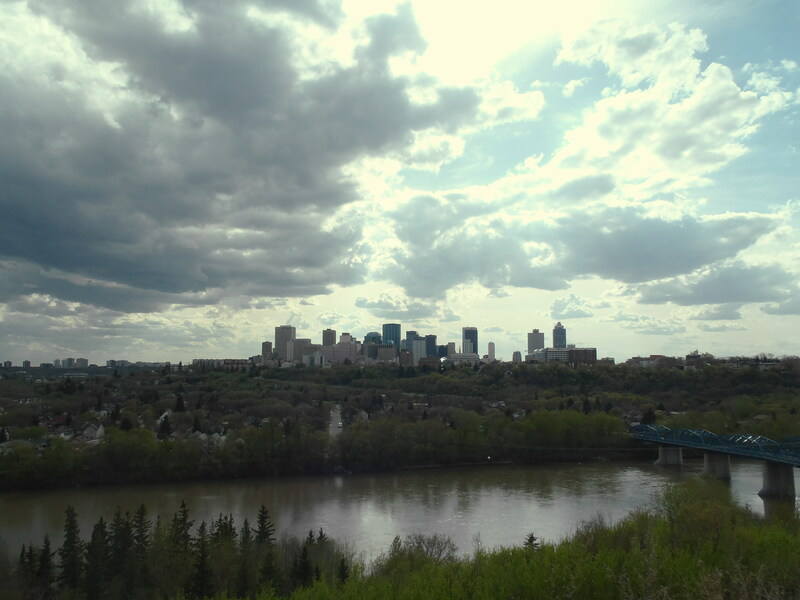 The Iron Horse is back in working order and ready to dive into the mighty fine Edmonton river valley trails. I had wanted to do a ride on Victoria day morning, but was forced to spend my few free hours at the Bikeworks North tuning the bike up. All is well now, and on the very next day I rode the Iron Horse on my daily commute. 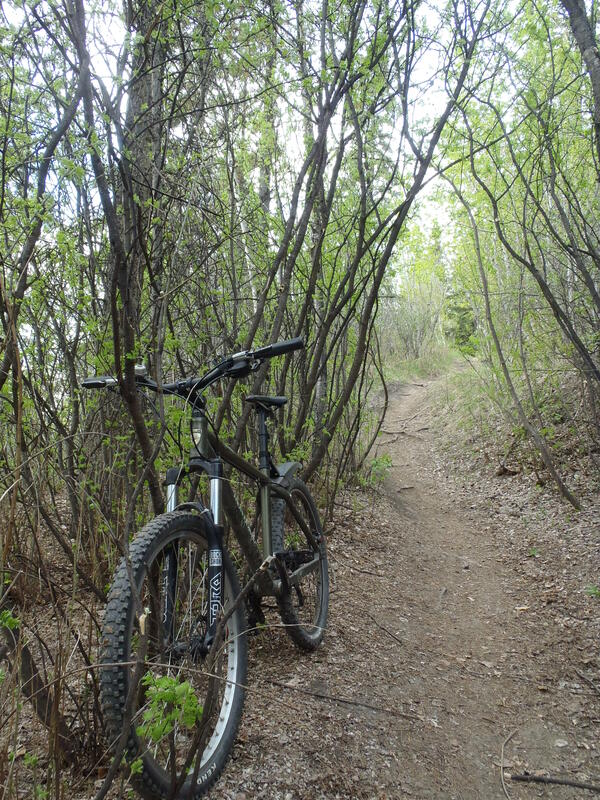 I love that my city has such a great network of singletrack, so easily accessible. I’m particularly lucky that I can plot a route more or less directly to work on these trails. My trip in the morning was more on pavement than I planned because I was running late, but I took my time on the way home and spent as much time as possible rolling the big tires through the dirt. I hope to do this sort of commute at least once a week this summer, weather permitting. 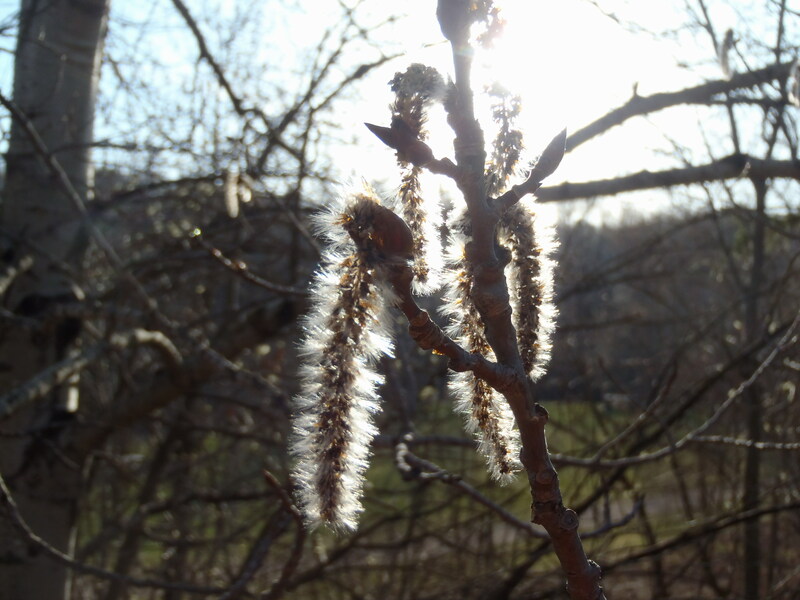 I was mostly having too much fun to stop and take photos, but I did manage a token few. 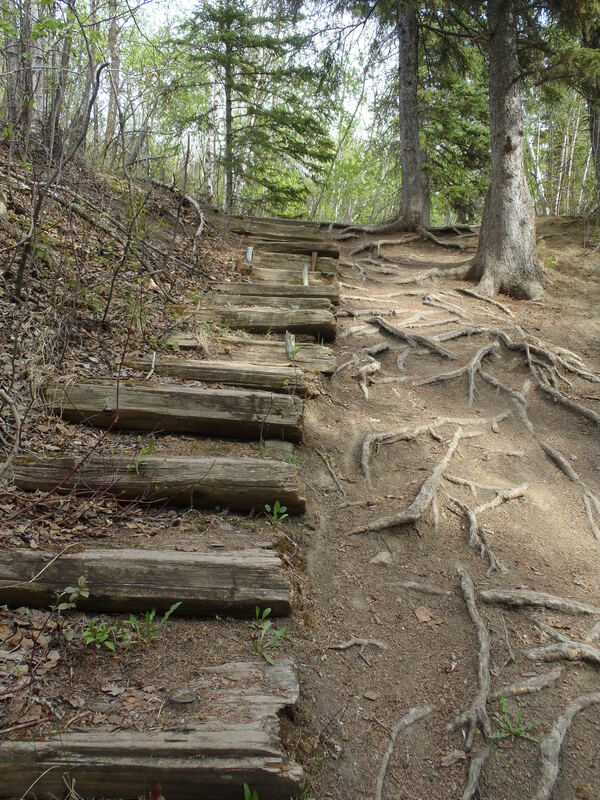 Take your choice: abandoned stairs or tree roots. I never tire of the prairie cloudscapes. With the polar vortex instability this winter and the unusually cold weather our southern American neighbours have been experiencing, it’s not surprising that there has been a lot of chatter about windchill. A fellow Edmonton winter cyclist recently referred me to an article from Scientific American on the subject. The article contains some interesting facts about our bodies and how we perceive temperatures but incredibly seems to come to the conclusion that windchill isn’t real or useful value. I was pretty surprised to find this coming from Scientific American. Windchill temperatures are an important consideration in a frozen country where your morning bike commute might be at -30°C with a brisk northerly wind. The sad truth is you can’t escape the first law of thermodynamics. It’s all about heat transfer. It can be a complicated subject but I’m going to address some of the basic facts. Our bodies cannot measure temperature. You can’t stick your hand out the window and determine that it’s -28.5°C. It’s kind of similar to the fact that most of us mortals are not able to hear a musical note and determine that it’s A above middle C. With temperatures this means that we can only sense difference between the ambient temperature and the current temperature of the body part we’re exposing to the air (please be judicious in choosing the body part you expose). It’s like hearing two musical notes and being able to know the interval without knowing what the frequency of the notes are. What our bodies actually sense is heat transfer: heat loss or heat gain. Mostly heat loss, actually. At about 37°C our body is almost always hotter than the surrounding air. Our chemical engine of a body is constantly producing heat that we need to get rid of. If you ever find yourself in a situation where your body is actually GAINING heat then you are in serious trouble – heat stroke is a life threatening emergency. 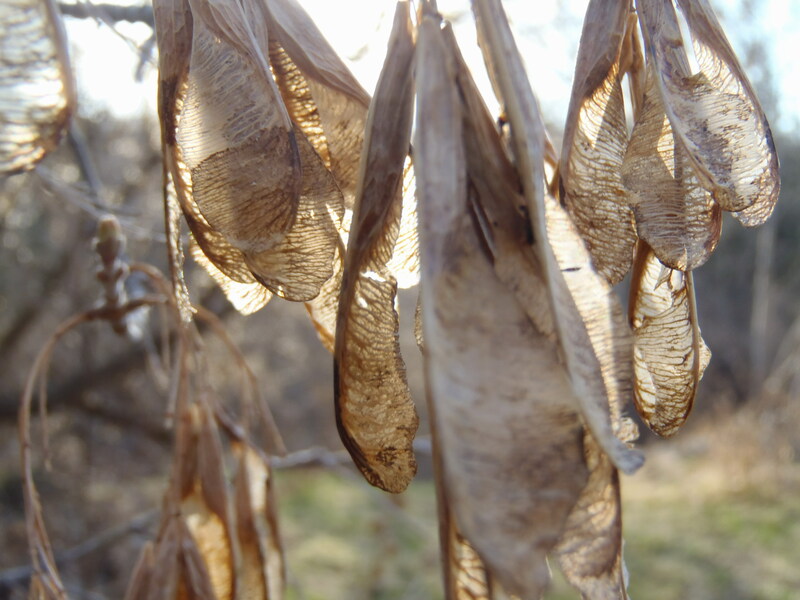 On a hot summer day we are only able to slowly shed our excess heat and so we feel hot, on a cold winter day we are more rapidly losing heat and so we feel cold. This is important when it comes to wind chill. Our sense of temperature is based on how fast we are losing body heat. On a windy day we lose heat faster, and feel colder. This is why windchill calculations are used. For example, it might tell us that although the air temperature is -20°C, the wind will make us lose body heat at the same rate as if it were -30°C. This is a valid and useful piece of information for people who venture beyond the realms of house and car. The devil is in the details here, however, and determining that heat transfer equivalence isn’t trivial. Most of the useful information in the Scientific American article speaks to this point. The Scientific American article asks us to consider the dashboard thermometer of a car. Does it measure a different exterior air temperature when you drive faster? No, of course not, and so the the author dismisses the relevance of windchill. However, giving some consideration to the basic physics of windchill reveals this thought experiment to be flawed. True, the actual temperature of the air does not change as you vary the speed of your vehicle, but the rate at which your vehicle is losing heat IS changing with the airspeed. The vehicle is experiencing a windchill factor and the driver will have to crank up the heat in order to maintain a comfortable temperature inside the car. My house experiences windchill in this fashion – on a cold, windy night I turn up the thermostat, burn more gas and have a higher monthly bill as a result. One could imagine a specific windchill calculation for buildings. The heating engineers certainly already have one. An unheated inanimate object will experience wind chill until it cools to the same temperature as the surrounding air. A cup of coffee left outside will cool quicker in the wind than if there was no wind. The coffee will continue cooling until it’s the same temperature as the surrounding air and after that it doesn’t matter how hard the wind blows – the coffee is already at equilibrium. But until that point, you could do a wind chill calculation for the coffee cup. If your human body reaches the same temperature as the surrounding air when it’s -20°C outside then it also cannot be affected by windchill – besides which, you’d be dead. Considered from a cycling point of view it then becomes crucial to consider the wind direction when interpreting windchill temperatures. Suppose, Environment Canada tells me that it’s -20°C outside with a windchill of -30 and the wind is coming from the north a 18 kph. Lets consider three basic scenarios that might then happen during my morning commute. First, if I pedal south at 18 kph then I am travelling at the same speed and direction as the wind and so I experience no windchill. I will only lose heat at a rate for the actual temperature of -20°C. Second, if a red light causes me to sit unmoving on my bike at an intersection, then I am losing heat at the same rate as on a -30°C calm day. Thirdly, if I suddenly remember that I forgot my lunch and then turn around head back north INTO the wind then I increase my windchill above the one in the forecast and I lose heat at even faster rate – and I freeze my stem off if I’m not properly dressed. I actually consider these factors when I leave the house to go to work each winter day and I use the information to choose my clothing. This is why the windchill temperatures are indeed relevant and useful information, and not a figment of a meteorologists imagination. It can be vital to know when you are moving around in dangerous temperatures. There are no words for how much I love this chase scene from the 1971 pilot for McMillan & Wife. If you patiently stick around and watch until 1:06 you’ll see why. 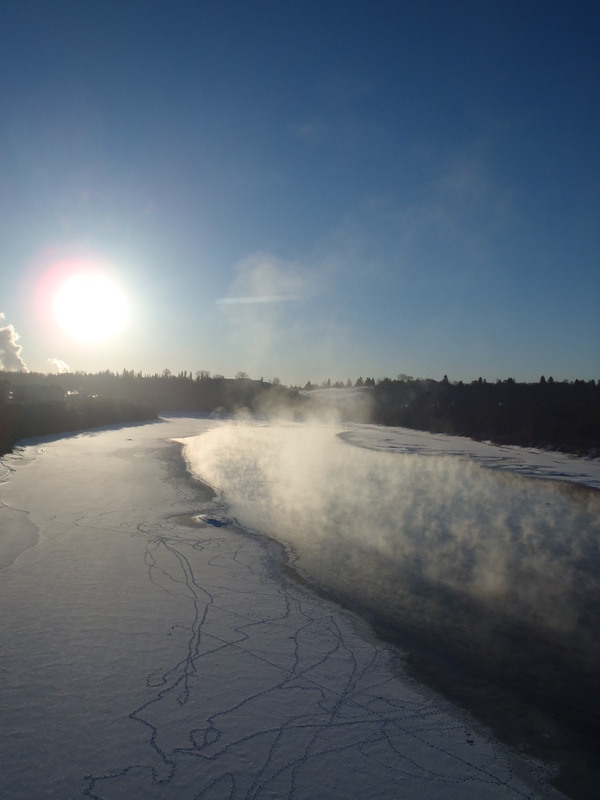 Local winter cycling veteran and fellow Bikeworks volunteer Robert Clinton has written a detailed lexicon naming the various snows and ices that winter cyclists encounter in Edmonton. 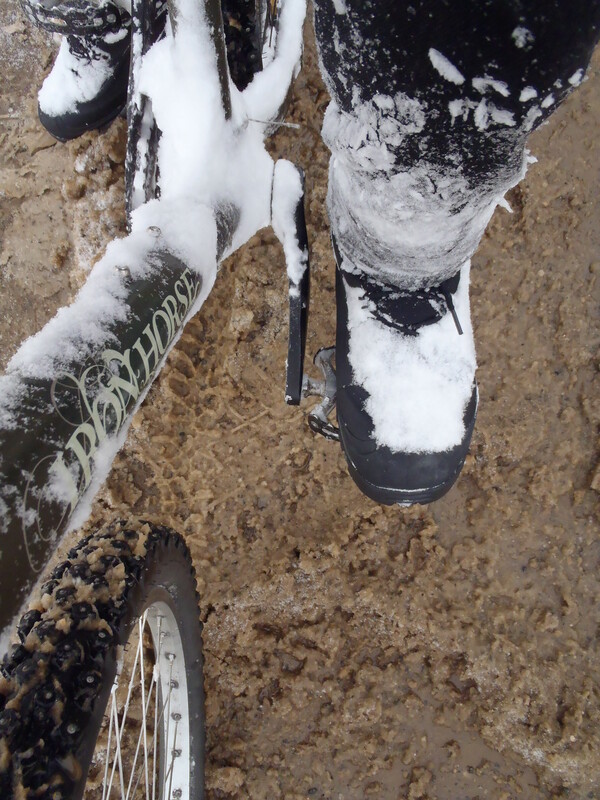 There is also a heaping helping of winter cycling philosophy and tips on dealing with these assorted conditions described. 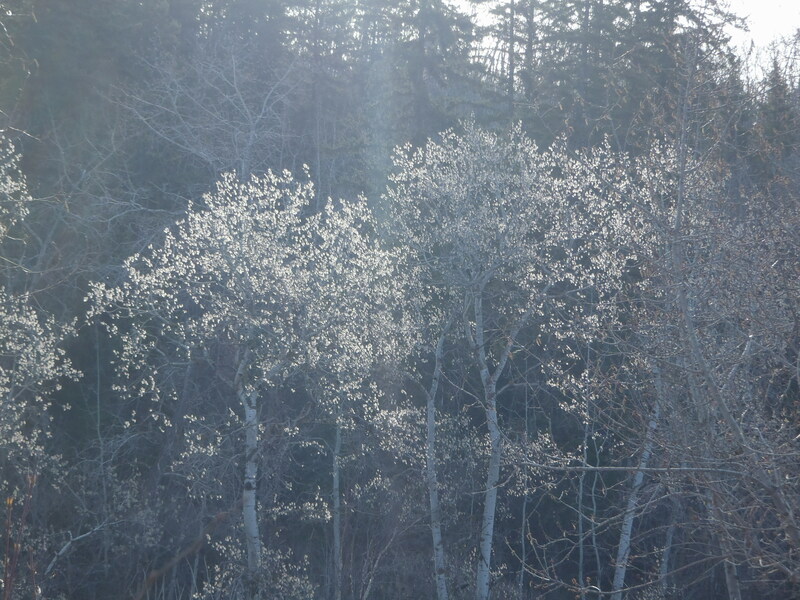 I’ve added this document to a new winter cycling tab at the top of my blog and I hope to add some photos of the various snows and ices at some point. 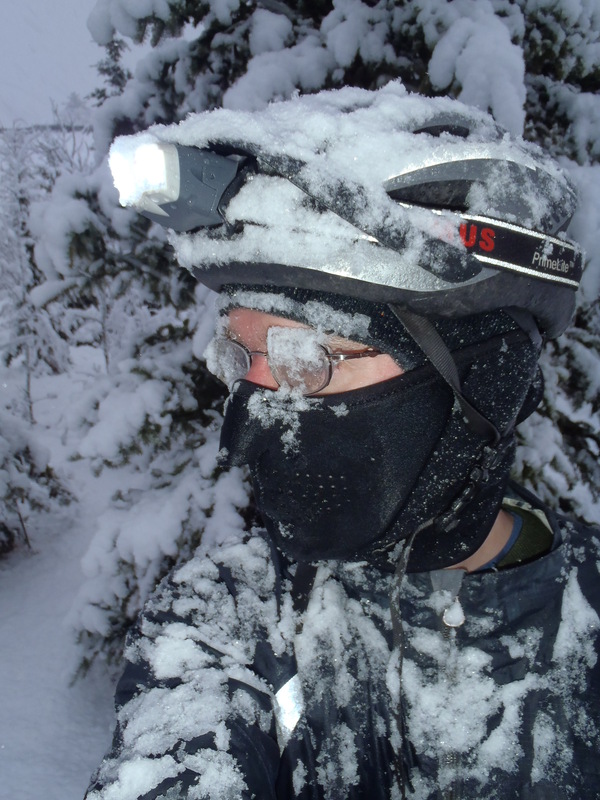 Check it out if you ride in winter conditions, are thinking of doing so, or are just morbidly curious about the mindset that produces a winter cyclist. It’s a detailed treatise, so get a hot beverage before you settle down to read.